Ever experienced an unpleasant person which acts badly, and afterwards thought to yourself: “What goes around, comes around”? That’s a westernized version of karma philosophy. How about this one – “Good deeds pay off”? Every action results to a consequence, but when we apply this thinking to people and actions that have no apparent consequence, we would like to think that there is some justice above ourselves that apply itself. Like a natural law – which is what karma is. A natural law that applies itself whether we see it or not. The truth is that when you and I insist on that all-too-comfortable paradigm of cosmic score keeping, we’re no longer talking about Christianity. In fact, what we reveal is that we’ve adopted (unwittingly) a Westernized form of Hinduism. We are talking, in other words, about karma. 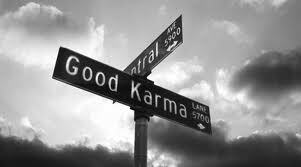 If you are a bad person and things are going well for you, it is only a matter of time before karma catches up with you and “you get yours.” If you are good person, the inverse is true: just be patient and your good deeds will come back to you. This entry was posted in Wonderings and tagged karma, Reincarnation by Haridasi. Bookmark the permalink.